Darius Rucker's return visit to NBC's Tonight Show Starring Jimmy Fallon was full of surprises. The country star not only teased his upcoming Southern Style Tour, he also took the opportunity to reveal that his fourth solo studio album, which shares its name with the tour, will be released March 31st.... 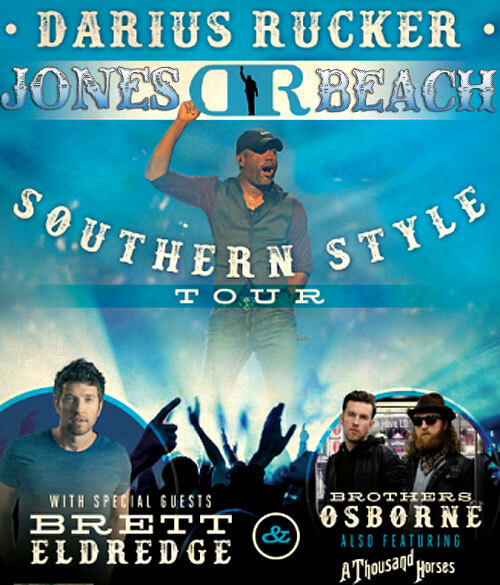 The arena-headlining Southern Style Tour will include an initial 30 shows with a stop at Jones Beach on July 12 and features CMA New Artist of the Year Brett Eldredge, as well as hot new country duo Brothers Osborne and Southern rockers A Thousand Horses. The first single from Southern Style, the equally alliterative "Homegrown Honey," was released last August. Co-written by Rucker with Lady Antebellum's Charles Kelley and songwriter-producer Nathan Chapman, the tune reached Number 13 on Billboard's Country Airplay chart. "It's a little different for me," Rucker tells Rolling Stone Country of the track. "It's not one of those family songs — it's really a country party song. It's talking about some country girl who lives in New York City. It's got hooks galore." The new album teams the singer-songwriter once again with producer Frank Rogers, who has been at the helm of all three of his previous studio albums as a country artist. "Frank does great Darius records," Rucker raves. "I can't go in to record with the attitude that I want to sound different. It's all about the songs for me. I want great songs. And if we have great songs, then Frank is the genius and does what he does."